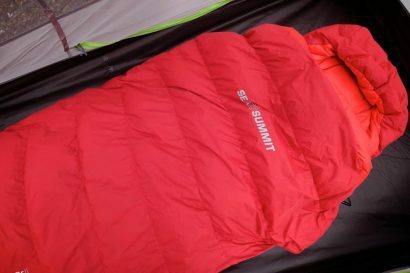 It’s an inevitable part of backcountry travel. Stay out in the bush long enough and you will eventually stink. I’ve traveled with guys capable of such a funk it can make an onion cry. Nothing but a full hose-down can quell the smell. But as we all know, showers are hard to come by the further afield one travels. Like many people, I’ve tried all manner of personal cleaning products including baby wipes, soap leaves, and even no-rinse shampoos. None of them really worked, or more often than not, required precious volumes of water I couldn’t afford to spare. The stalwart of the modern camp bath has been the wet-wipe sold under various brand names, most of them designed to clean your hands—or a baby’s tiny bum. I’ve used them for years with moderate success. In most cases I burn through half a dozen wee towelettes ending the session not truly clean and smelling like a cumquat dipped in rubbing alcohol. 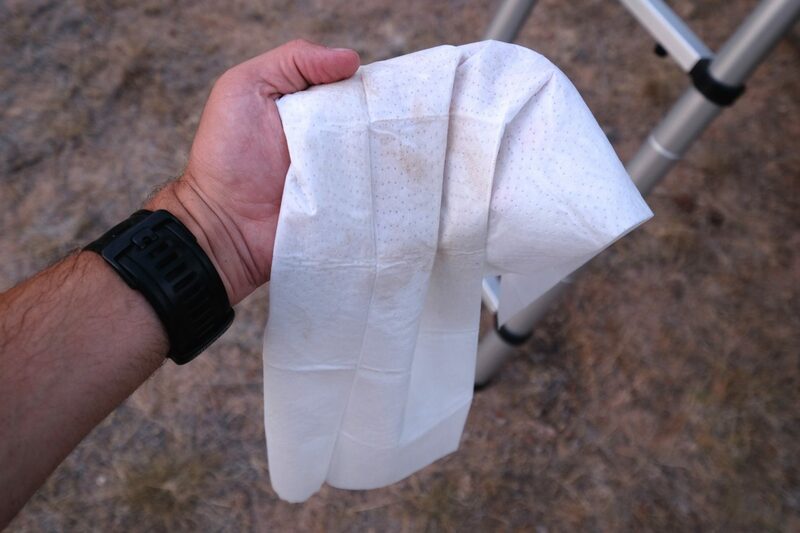 About a month ago I learned of an improved riff on the pre-moistened body wipe, one created by members of our own overlanding tribe. Called the Shower Pouch, it’s a more practical attack on the waterless shower. Created a year and a half ago, Shower Pouch is the offspring of two guys with extensive professional experience in the skincare industry. Experts in R&D, they set out to design and produce a body wipe capable of a tall task—cleaning a full-grown dirty human being. The most obvious difference between the Shower Pouch and all others is the size. Whereas most are measured in inches, the Shower Pouch towel is 2 feet long and a foot wide. 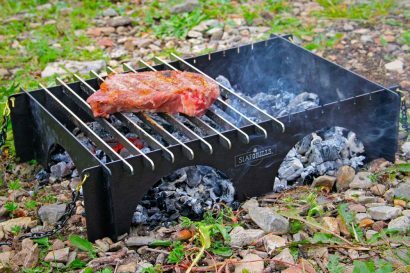 What’s even better is the thickness and durability of the material. It’s strong enough to endure a diligent scrub without tearing or deteriorating. The pH balanced soap formula is also vegan and hypoallergenic and is surprisingly effective at cutting through grime. If that doesn’t win you over, it’s even made in Los Angeles. You know you needed a scrub when you see the grime picked up by the Shower Pouch. 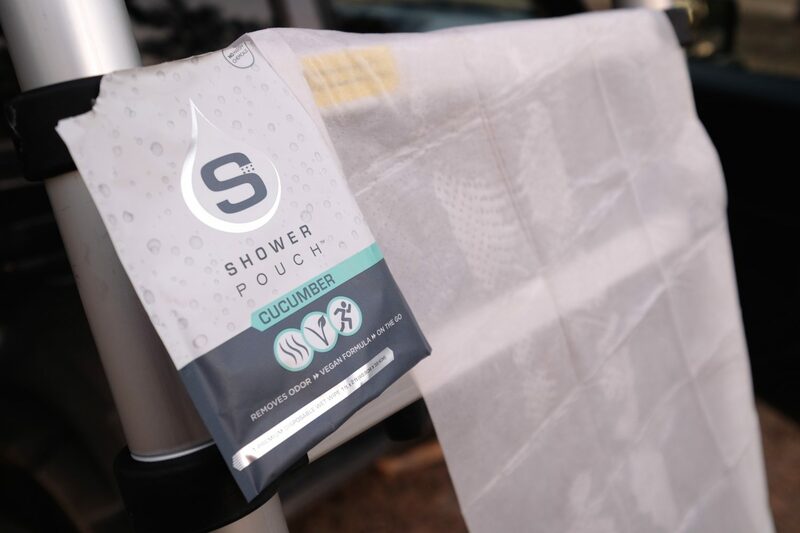 Available in unscented, bamboo, and cucumber scents, each Shower Pouch is packaged with just enough moisture to help wipe away dirt, sweat, and odor. The Aloe and Tea Tree oils leave behind a sense of cleanliness that really is refreshing after a hard day in the sticks. As an avid mountain biker I can ride the day away while coating my body in a heavy layer of dust and sweat. The Shower Pouch makes short work of post-ride cleanup. 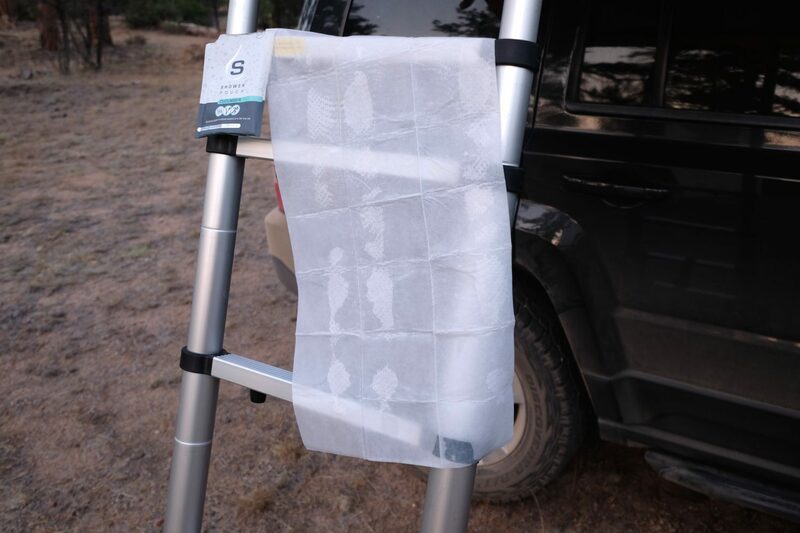 Even in the dry desert, the towel stays wet enough to get the job done, and if necessary a few drops of additional water extends the wash time. I never knew I liked the aroma of cucumber so much, although the scent vanishes quickly. The fragrance left behind is mild enough I don’t crawl into my car or tent smelling like a debutant or a newborn. I just smell and feel clean. After comparing the Shower Pouch to what seemed like similar products, I have learned it’s anything but. There’s far more to it than just a larger towel size. It cleans better, smells better, and I get the satisfaction of knowing it’s one more quality product made in the USA by guys who like the same things we do—getting dirty. 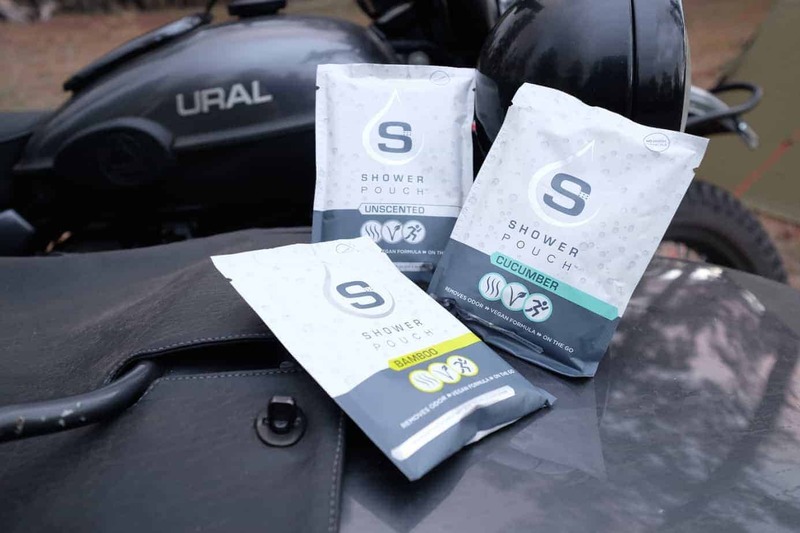 As mentioned above, the founders of the Shower Pouch are overlanders themselves. The swell guys they are, they wanted to extend a special offer to the rest of you. 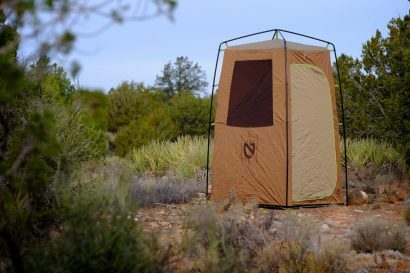 Visit the Shower Pouch site listed below, enter the discount code, EXPEDITION, and receive 30% off your order. That’s a kind offer and reason enough to wash the funk off your next trip. Smells like a good idea, right?